Dr. Suezone Chow is a gifted researcher and intuitive businessman who has worked to help us get more value from our forests in British Columbia. Dr. Chow was born in Taipei, Taiwan. 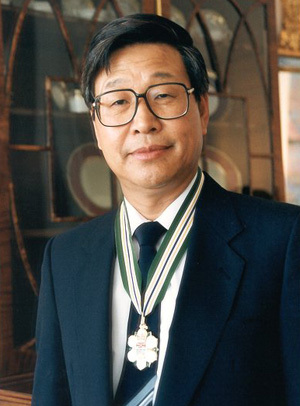 Following graduation from Taiwan National University in 1963, he emigrated to Canada. Starting with his post-graduate studies at the University of British Columbia, continuing with the Canadian Forestry Service, and today as Director of Research and Development at Canfor Corporation, he has developed a scientific reputation on both national and international fronts. His pioneering scientific work has contributed vastly to the economy of British Columbia through the development of new wood lamination techniques and environmentally friendly surface coatings, to mention just two. Combining his technical expertise with his fluency in Japanese and his cultural sensitivity, he travelled to Japan in 1973 helping to increase British Columbia’s share of the plywood market in that country. Until very recently he was involved in a trade mission to Taiwan demonstrating the use of wood and engineered composite products to facilitate marketing these products throughout the Pacific Rim countries. Dr. Chow has successfully married academic disciplines with industrial research and development and international trade . His successes continue to benefit all British Columbians.